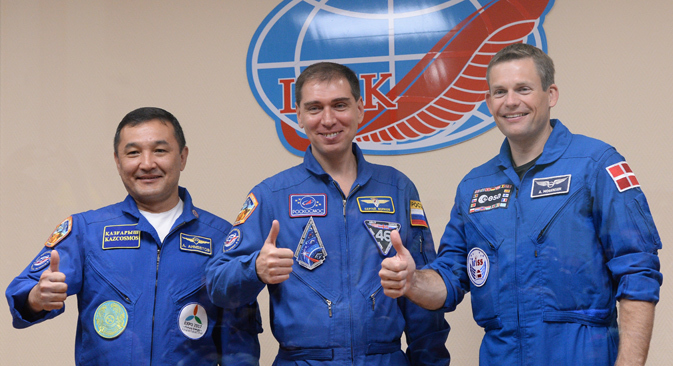 The international crew of the Soyuz spaceship departed from the Baikonur spaceport on September 2. On September 2, a new crew blasted off to the International Space Station, and included Sergei Volkov from Russia, Andreas Mogensen from Denmark, and Aidyn Aimbetov, a military pilot from Kazakhstan. Since little time was left for preparations, the Russian Space Agency gave the seat to a professional instead of a space tourist. Aimbetov took a Kazak flag aboard the ISS, while Mogensen took 26 Lego figures, which of course are toys invented in Denmark. The crew will carry out 47 scientific experiments in space. The Russian Soyuz-TMA-18M Spaceship became the 300th spaceship launched into Earth's orbit since the flight of the Soviet Union's Vostok in 1961 with the world's first astronaut, Yuri Gagarin. Soyuz will dock at the ISS on September 4.